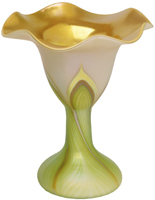 Hand blown glass fluted bowls of all shapes and sizes, all colors under the rainbow, some with extra accents such as lip-wraps and even some with real gold added for that extra sparkle. 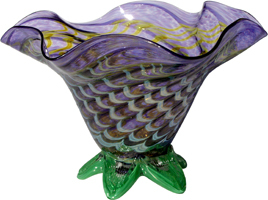 Each hand blown glass fluted bowl is unique work of glass art, with no two being the same. Saul's hand blown glass fluted bowls are the most popular type of hand blown glass bowls, and are superb examples of modern glass blowing at its finest. Glass art bowls are your not traditional bowls, bringing high style and form over function. 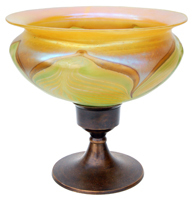 Decorative glass bowls are perfect centerpieces as a focal point in your home. 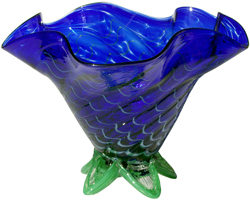 Hand blown glass bowl designs in vibrant colors make a glamorous glass collection and are a truly expressive piece of art. © 2018 Santa Barbara Art Glass by Saul Alcaraz. All Rights Reserved.